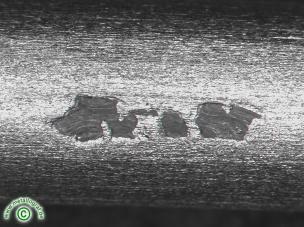 Non metallic inclusions, in this case chromium oxides, branch-on through the casting process, can occur in the steel. If these occur as large chunks on the pre-material surface, they are rolled with the material and afterwards they can stay on the rolled piece surface. A removal at the pickling produces strong holes in these places.